In the early 1990s, word was spreading that Halcion, a popular short-acting sleeping pill prescribed for the treatment of insomnia, was a dangerous drug. Not only did it make users anxious, depressed, and suicidal. It was also implicated in a series of murders. (The murderers were absolved of their crimes based on the argument that Halcion rendered people incapable of understanding their actions). Sales of Halcion plunged. Today the drug is still on the market but is rarely prescribed. Now zolpidem (Ambien) is receiving intensive post-marketing scrutiny, raising questions about the drug’s safety. In January 2013 the Food and Drug Administration lowered the recommended dose for women and older adults from 10 mg to 5 mg following reports of zolpidem-related car crashes and an analysis linking the drug to drowsiness in the morning. Studies and reports published in the past 2 years cast more doubt on the drug’s safety. So is zolpidem now set to go the way of Halcion? About 5 million Americans now use medications containing zolpidem (generic zolpidem, Ambien, Ambien CR, Intermezzo, Edluar, and Zolpimist), according to the Institute for Safe Medication Practices. Like several other sleeping pills, zolpidem acts on GABA-producing neurons, helping tranquilize the brain. Benzodiazepine drugs like Halcion bind to several kinds of GABA receptor complexes and consequently produce a range of adverse effects. Zolpidem binds more selectively. Early tests showed that it facilitated sleep and produced fewer adverse effects. So the FDA in 1992 approved zolpidem for “short-term treatment of insomnia characterized by difficulties with sleep initiation.” FDA approval of the extended-release version came in October 2005—notably without the short-term restriction. Zolpidem in its many formulations dominated the hypnotics market for years despite occasional reports of people sleepwalking, sleep eating, and sleep driving under its influence. People with zolpidem-related problems and injuries were also showing up in hospital emergency departments. The Centers for Disease Control and Prevention recently reported on a survey of psychiatric medications identified as the reason for emergency department visits. The results were surprising: of all psychiatric medications prescribed, zolpidem ranked first in adverse drug event cases. About 11.5 percent of all emergency department visits among adults were attributable to zolpidem, as were 21 percent of the visits in adults 65 and older. Authors of the report estimated that zolpidem accounted for 10,212 annual visits to hospital emergency departments, 25 percent of which required hospital admission. In a study in Mayo Clinic Proceedings (May 2014), Taiwanese investigators found that long-term zolpidem use significantly increased the risk of major injuries requiring hospitalization. Depending on the dosage, users young and old were 2 to nearly 5 times as susceptible as nonusers to head injuries and fractures. In a large study in the American Journal of Public Health (August 2015), University of Washington researchers used new prescription and collision records to determine the relationship between the use of sleeping pills and motor vehicle crashes. Regular users of zolpidem were over twice as likely to have crashes as nonusers. Zolpidem was originally approved for short-term use only, yet 68 percent of the users with drug-related injuries or problems were long-term users of zolpidem, on average taking a pill about 2 nights out of 3. Despite the FDA’s recent recommendation that women and older adults be prescribed the lowest approved dose of the drug (5 mg zolpidem or 6.25 mg extended release), in 2012 (before the recommendation came out), few people were taking the lower dose. Drug-drug interactions were common among regular users of zolpidem. Prescribing information warns against taking other drugs that depress the central nervous system while taking zolpidem. Yet about 22 percent of regular zolpidem users were also using opioids on a sustained-use basis. About 23 percent were taking another drug (a benzodiazepine, pregabalin, or gabapentin) that, like zolpidem, acts on the GABA system, producing complex effects. Finally, the prescribing information for zolpidem says the drug may worsen depression and suicidal thoughts in patients with depression. Yet 34 percent of the regular users of zolpidem were also using an antidepressant. Many regular users of zolpidem may never experience drug-related complications. (This may also have been the case for the majority of Halcion users.) But with so much data now showing that zolpidem is causing harm to significant numbers of users, prescribing patterns will likely change. Don’t be surprised if the next time you ask for a renewal of your zolpidem prescription, you’re prescribed something else instead. If you use zolpidem for insomnia, how do you feel about the possibility of losing access to this sleeping pill? I am dependent on Xanax, not Zolpidem, for sleep. It is a real problem that I can’t seem to overcome, even with medical assistance & therapy, though no one really seems to make a serious effort to help. I am seriously desperate for help to the point that I get suicidal frequently, as the sleep onset insomnia has lasted for years. The problem also exasperates a problem with adult ADD, which makes it seem impossible to get a handle on. The fatigue alone is something that I don’t know how to deal with and I know only makes me less inclined to do the things that I need to do to overcome the insomnia. An anxiety disorder only further complicates things…thus the Xanax. I’m sorry to hear you’ve struggled for so many years with sleep onset insomnia. That’s the type I’ve struggled with too, so, believe me, I feel your pain. There are a few things in your comment that I want to respond to. Occasionally I use a sleeping pill to help me get to sleep, but I’ve never used them often enough to feel I was dependent on them. I’ve known people who have become dependent on sleep meds, though. Some are OK with it and some aren’t. It sounds like you’d like to find a way to get off Xanax. You mention that no one is making a serious effort to help you do that, or to help you with the insomnia. I do believe there are people out there who could help and who would care enough to want to help. It’s just a matter of finding the right doctor or therapist. When it comes to talk about insomnia, my personal experience with GPs and internists has been somewhat negative. The ones I’ve dealt with have never shown much empathy for my problem, and it seems that sleep disorders don’t get a lot of attention in medical schools, either. So I wound up feeling fed up with doctors and managing as best I could without them for many years. Then I started doing research on insomnia and writing my book, and I met quite a few sleep specialists in the process. I got a completely different sense about them. Unlike the GPs, they seemed to understand how debilitating insomnia can be, and they were able to propose better ways to manage it. In your case, you’ve got several things going on: the sleep onset problem, ADD, and an anxiety disorder. Obviously you’ve been to see doctors and therapists. But if you haven’t yet seen someone who specializes in treating sleep disorders, I would strongly recommend that you do that. There may be something going on that no professional has correctly diagnosed yet. And there may be better ways to treat the disorders that you have. If you can’t find a sleep specialist in your area, I’ve got a list of providers myself and would be glad to help you locate someone. 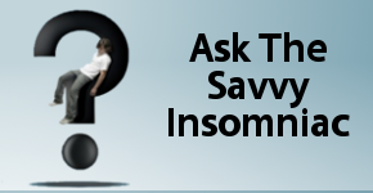 Just contact me through Ask The Savvy Insomniac or by clicking on “Contact” on the menu at the top of the page. I really do believe that help is out there and I hope you’re able to make the right connection soon. I am 50 and have used Ambien for 8 years. I started not long after starting a stressful job and having a hysterectomy (ovaries not taken). I had a fall 2 years ago that lead to whiplash and brain injury. The pain, harrassment from work (because they didn’t believe I had such difficulties and needed to take time off), and financial difficulties, and possibly menopause made sleep difficult. I take 2-3 Norco a day and muscle relaxants. I am a PT and so I have tried all I could in that area. MDs and couselors didn’t seem to help but I hope I can find help with the references you gave. Money and insurance is difficult though. It sounds like you’ve got quite a few health challenges to deal with and, on top of them all, trouble sleeping. I, too, hope that you’re able to make contact with a sleep specialist or therapist on one of the lists I mentioned in my response above. Books are more affordable still: The Insomnia Workbook, by Stephanie Silberman. The Insomnia Answer, by Glovinsky and Spielman. 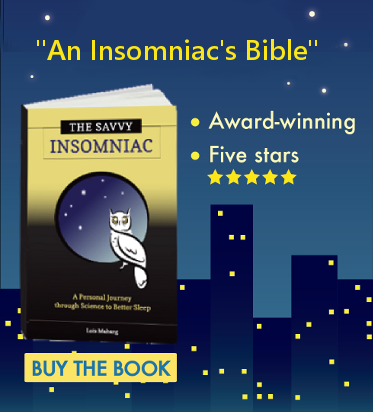 My book, The Savvy Insomniac, has a chapter on CBT for insomnia, chapter 8. It’s also got a chapter on current medications. The first thing I’ll say, reading about your situation, is that only you know your body well enough to understand what feels right and what doesn’t. If you sleep better at night and feel better during the daytime when you’re taking Ambien, and if your doctor continues to prescribe it, then, if I were you, I wouldn’t pay too much attention to what everyone else thinks. As I wrote above, in recent years, it’s become apparent that long-term use of Ambien and other so-called z-drugs can in some people have really adverse effects: falls requiring hospitalization, car crashes, sleep walking, and so forth. This is particularly true for older people who use these drugs. So, because a minority of users experience these negative effects, physicians typically adopt across-the-board policies that discourage prescribing these drugs to everyone. Thanks for writing in, and best of luck with your sleep. I found this article while googling effects of long-term Ambien use. I feel that higher doses might indeed account for a higher risk of injury, however for me personally, a 5mg dose turned out to be a life-saver. I started Ambien in May and I saw a significant increase in my sleep quality, and by that I mean it takes me less than 30 minutes to fall asleep, whereas before it would take two hours or more every night. Some nights I have to take 7.5 or 10mg as I also suffer from unmedicated anxiety, which makes Ambien less effective. Even so, I feel no drowsiness or depresonalization the next day. I’m actually more confident to drive, go to the gym (where I do heavy weights exercises and MMA) and do other focus- and body-intensive things now that I’m not a sleep-deprived zombie functioning on three hours’ sleep. I’ve also not had any hallucinations or unexplained loss of memory. Of course this is just anecdotal evidence. If they took Ambien off the market, I’d personally be worried, as this is the only medication that has helped me so far without any pronounced side effects, and my doctor and I have tried lots of alternatives over the years. I appreciate you taking time to describe your experience with Ambien. I’m glad it’s helping you sleep and find the stamina you need to work out at the gym. I use the drug occasionally myself and would feel resentful if it were taken off the market. But now I don’t see any signs that it will be taken off the market (nor was Halcion—or triazolam—ever taken off the market, although there were plenty of people who thought it should be and plenty of doctors who stopped prescribing it). Some physicians shy away from prescribing Ambien these days because of harmful side effects that have come to light in recent years. But you aren’t experiencing those side effects, and your doctor is evidently satisfied that the benefits of your taking Ambien outweigh the risks. I also found your blog while searching the effects of long term Ambien use. I have been on 10mg for about 8 years. At first, I thought it a miracle drug because I was finally able to sleep, and without next-day fogginess. But recently I have increased anxiety, extreme daytime drowsiness (almost falling asleep at my desk), confusion, and memory loss. After researching, I think it from the long term Ambien use. I have expressed my concerns to my doctor, who does not seem to be concerned and continues to prescribe it. But I have decided to taper off very slowly. I’ve tried to go cold turkey in the past, but was unsuccessful. This drug is so addicting, it should not be prescribed for long term use! I have been using ambien for over 20 years and can’t seem to sleep without it. They cut me back to 5 mg for about a year and my sleep was worse I was more depressed and had more pain and problems. Now that they have found I have severe sleep apnea and have put me on a CPAP I have had to go back to 10 mg. However it helps me fall asleep with that stupid thing on my face but I take the mask off after a few hours and don’t remember doing it. And now I’m also waking up after 2 to 4 hours of sleep and cannot go back to sleep even with 10 mg. While C pap therapy is supposed to help you it is hindering my sleep. And now my ambien will not keep me asleep through the night and I’m getting extremely depressed and fatigued and don’t know what else to do. I have a regular nightly routine I sleep in a darkened room, I have bought a new mattress and my pain level is actually worse and I’m sleeping less. I wonder if there’s anything else I could switch to that would keep me asleep because my body is suffering greatly. I tried CR version years ago but it wasn’t strong enough to help me fall asleep. I love the fact that ambien works quickly but now is not keeping me asleep. I do not sleep walk or sleep eat or any of that stuff. I have also learned over the years not to get on the phone or social media after I have taken one lol because yes it does lower your inhibitions And causes short term memory loss. If anyone has a better alternative, HELP!!!! not melatonin. It sounds like you’ve got a couple problems that are really diminishing your quality of life, and I’m sorry to hear that. If you can find ways to manage those problems, though, you might not need the sleep medication at all. First, you mentioned having pain but you didn’t say what type of pain you’re dealing with. If I were you, I’d look for help in managing the pain, because pain can interfere with sleep. I used to wake up with low back pain quite often until I consulted a physical therapist. She suggested that I try a new sleeping position (on the side, with top leg bent and knee resting on a pillow). It’s a simple change of habit, yet that’s the way I sleep now and I hardly ever wake up with back pain anymore. This has helped with my sleep. Last, you mention depression. There’s quite a strong association between depression and sleep problems. The causality can go both ways, with depression creating sleep problems or sleep problems leading to depression. Regardless of which condition came first for you, I think it would be a good idea to explore with your physician the possible ways of treating your depression. As I said before, if you can find effective ways to manage these problems, your sleep just might improve. If it doesn’t, then use the site search box on the right side of this page to look for help with insomnia treatments, CBT, alternative treatments, and sleeping pills.